Over the course of a year, we use/send out quite a lot of samples. Many are sent to wine fairs and tastings organised by our own D.O. office, for tastings either here in Spain, or in International Wine Fairs. Others are sent to existing customers who possibly want taste a new vintage. Then of course there are potential customers, who will almost certainly request samples before making any buying decisions. In Canada and a number of Scandinavian countries, wine import is still government controlled. The State owned shops will usually send out two or three tenders a year for albariño. This entails much form filling and the sending out of yet more samples for their tasting committees. (The downside is that there is usually only one winner, and no prize at all for coming second). Wine competitions are by far the biggest sample consumers (assuming that you play the game). The problem is that there are now dozens and dozens of International Wine Competitions – some apparently organised in small, obscure villages in the middle of nowhere, but still claiming to be “International”. 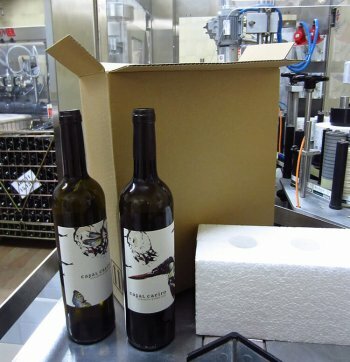 The high cost of sending samples is quite apart from the fact that you also have to pay to have your wines tasted (often 100-150€ per entry). I do often wonder how ‘legit’ some of these competitions and would-be importers really are? Just imagine the scam of writing to hundreds of wine cellars requesting 3 or 4 sample bottles from each, perhaps using the facade of a fake website. That could result in one huge garage sale or maybe just one hell of a party!